Serves as the college's "one-stop-shop" for program information, advising, financial aid, and credential advising and evaluation. Would you like to learn more about becoming a teacher, a school psychologist, a school principal, a bilingual educator, or a special education teacher? Or would you like information about programs in other areas, such as rehabilitation, counseling, and educational technology? The College of Education at San Diego State University offers a wide variety of programs, including those that prepare professional educators for elementary, middle, and high school positions. Academic programs range from undergraduate study to advanced degrees. 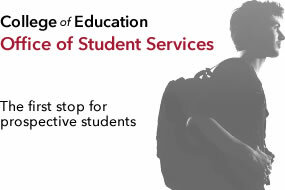 Also, make sure to visit the Office of Student Services, your "one-stop-shop" for everything from advising to financial aid.